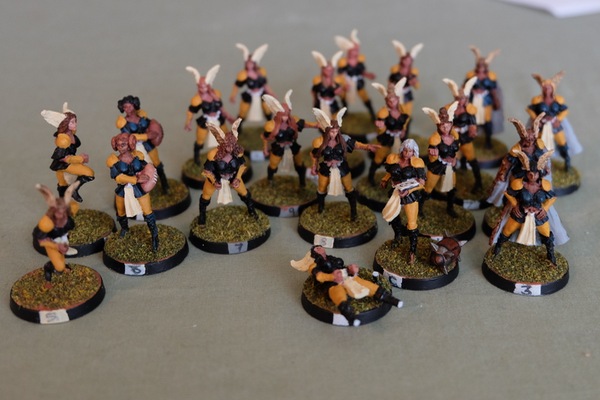 The league is underway with the Amazons doing on the worse side of OK. You can follow their progress on our league page BABBL, I particularly recommend reading the news posts as all the league players have really gotten into the spirit of the game. The progress of getting them painted up has been somewhat better with the base coats finished, bases done and some washing / terrible highlighting done. I have also managed to snap one of my figures so that's going to take some pinning, gluing and maybe a little green stuff. Given that the Snotlings look a bit weird and deff not legit GW, I figured I would cave and actually give GW some of my money for a box of Ogre Kingdoms Ogres. I have actually always loved this race but held off of buying... for the most part (my Chaos Dwarf Hobgoblins are converted Gnobblars). 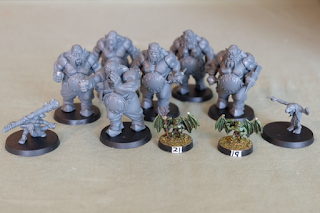 The box comes with 6 Ogres and a few extra Gnobblars that I can use as coaching staff! All in all, a perfect set up. I think they are already looking pretty good and now I just need to get some green stuff and paint on them and that will be another team painted up (5 teams total!). 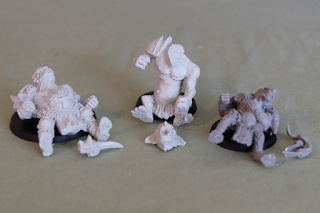 I am pretty stoked about cracking out the green stuff again as I haven't done much sculpting recently and I may be helping a new sculptor get up and running as he looks to try out pads, knuckledusters and maybe even helmets!